Frustration. It’s a feeling that everyone who drives to work on a regular basis knows. You’re stuck in rush-hour traffic, and you are running a little late for work, or just anxious to get home. The lane you’re in finally starts moving … only to come to a standstill once again a mile or two down the road. It’s the kind of situation that builds road rage. If you’re an investor in the automotive market, you’re probably feeling a bit of “road rage” right now. On Monday, China announced that it was trimming auto import tariffs to 15% from 25%. China is also reducing the tariff on imported car parts to just 6%. It was a historic move by China, which had held those tariffs for more than a decade. The new rate goes into effect on July 1, and is viewed as a good-faith move by China as part of ongoing trade negotiations with the U.S. The news sparked a rally in the automotive sector, providing a bump for U.S. automakers General Motors Co. (NYSE: GM) and Ford Motor Co. (NYSE: F). The effect was even greater for Toyota Motor Corp. (NYSE: TM), which has a much greater presence in China than either Ford or GM. Things were looking positive for automakers and auto parts suppliers. Then, on Thursday morning, President Donald Trump announced he wanted to impose tariffs on auto imports into the U.S. According to the Wall Street Journal, those tariffs could be as high as 25%. The short-lived rally in the auto sector hit the brakes. The question now is whether this latest flurry of news will benefit automakers, or is it time to park auto sector investments and look elsewhere? 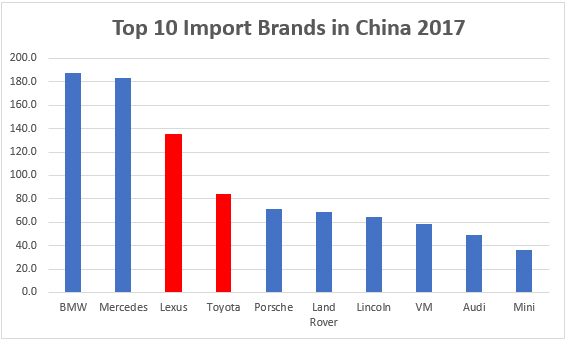 Toyota is the single-largest auto importer in China. The country imported more than 219.2 Toyota and Lexus vehicles combined in 2017. Breaking those figures down, Lexus accounted for 134.9 million imports, putting the brand third behind BMW and Mercedes. After China announced lower import tariffs, Toyota stock surged more than 6% and was set to challenge multiyear highs. But no matter how promising Chinese sales were, the threat of a 25% U.S. import tariff was more than enough to offset those gains. As you can see, TM stock is now trading lower than it was prior to China’s announcement. The impact was felt across the board in the auto sector, sending the First Trust Nasdaq Global Auto ETF (Nasdaq: CARZ) into bear market territory. 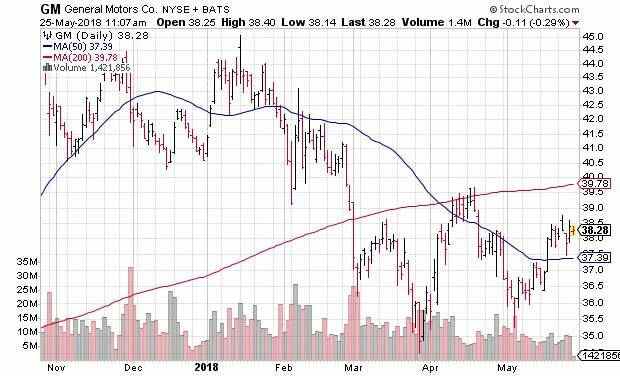 What’s more, the exchange-traded fund’s 50- and 200-day moving averages are poised for a “death cross.” Note that Toyota is the second-largest holding in CARZ. General Motors and Ford round out the top three holdings in CARZ, but neither of the major American automakers reacted to Trump’s tariff news. 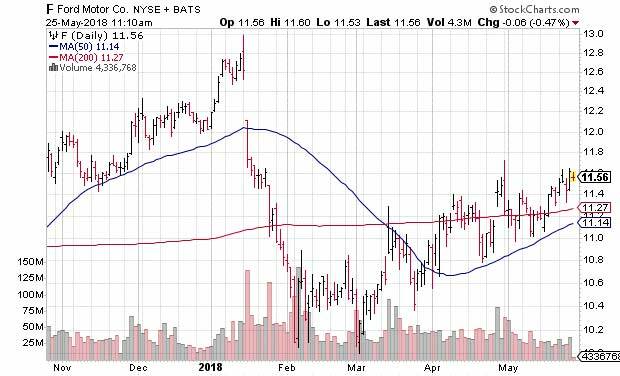 GM rallied back above its 50-day moving average following China’s reduced tariffs, but remained stoic following the U.S. revelation. 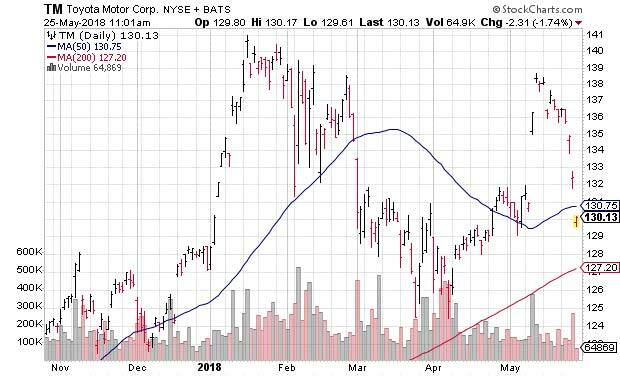 Ford stock reacted similarly. Getting a boost from China and flatlining on the U.S. tariff news. I’ll leave the politics at that, and say that the charts above speak for themselves. Prior to the U.S. tariff announcement, I would have recommended both Toyota and Ford. Both had much to gain from the drop in Chinese tariffs, and Ford stock was in the process of rebounding on solid SUV demand. Now the auto sector is stuck in a traffic jam. I don’t see Japan and Toyota standing idly by in this situation, and if the country can gain some concessions on the new tariffs, TM stock could once again be a contender for investment. The best course of action is to wait and see how this pans out if you are holding TM, F or GM stock. In the meantime, there are better places to invest your capital. Until next time, good trading! Editor’s Note: There’s a single line of code that will do for cybersecurity what Google did for search engines … what Amazon did for online shopping … what Netflix did for video … and what Facebook did for social media. But rather than affect just one industry … it affects ALL industries. Today, the market for this code stands at just $80 billion. But as demand rises, experts predict this market will blossom into a $1 trillion powerhouse by 2021 … a massive 1,200% increase in just a few years. To find out how to take action on the state-of-the-art cybersecurity companies that are about to soar higher, click here.